Kjells Page: From "polluter wins" to stabilizing the climate - 2050 goal, 2020 targets and equity principles. From "polluter wins" to stabilizing the climate - 2050 goal, 2020 targets and equity principles. It went almost unnoticed when COP16 in Cancun agreed that the global community would set a long-term global target to mitigate climate change at COP17 in Durban. I did not notice until I went to a meeting on "Implementing the Cancun Agreements" and had a read through the full text. 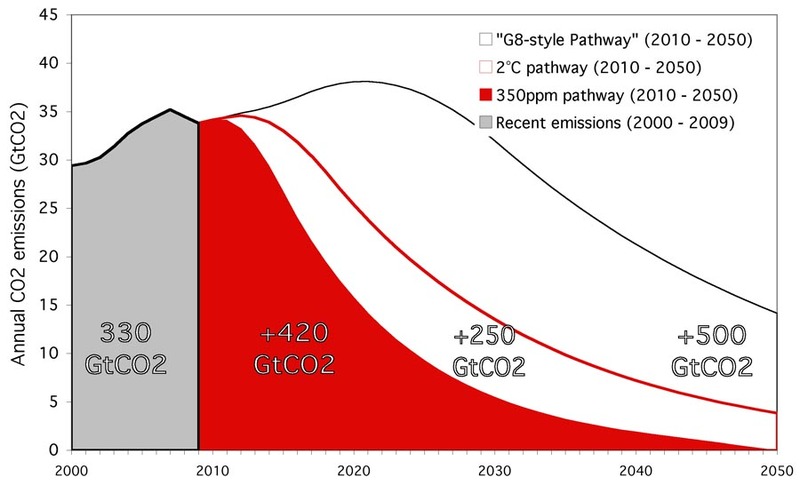 For me it is quite clear that by 2050 we need to reach zero fossil emissions. I don't want to live in a "2° world" which risks passing various tipping points. At 0.8° we may already have tipped over the Greenland Ice Shelf, which will lead to 6-8m sea level rise over the next 300 years. We don't know. But still we are planning to allow 0.7° more warming, or even 1.2° more. A 350ppm Emergency Pathway, from which I reproduce the main graph below, gives us an idea of the sort of reductions we need to stay below 2° warming. For me, the better goal is maximum 1.5° warming. This goal is supported by over 100 countries, co-incidentally the most vulnerable and already affected ones. Agreeing on a global target needs some preparatory work during the year. In order to facilitate this work, I have calculated some numbers which are key, but unfortunately do not appear anywhere on the world wide web: the Copenhagen Accord Pledges, translated into per capita figures. How much - per capita - would countries like to be emitting in 2020. 2020 is exactly half way from 1990 when the problem was fully recognized to 2050 when the complete decarbonization of the world economy must have been accomplished, if we want to have any chance of staying below 1.5°C warming. A huge problem in the current UNFCCC negotiations is that the challenge is still framed as "sharing mitigation effort". But "mitigation effort" is like "effort not to steal". It assumes that a bad thing is normal and not doing it requires effort. As pointed out to me by Maldives representatives in Cancun, there is no such thing as a "right to emit". We are already beyond safe CO2 levels in the atmosphere, and we need to stop emitting carbon as quickly as possible. And we will still be leaving behind a huge task of removing excess carbon from the atmosphere. In that situation characterizing the reduction of emissions as a burden and talking of "burden-sharing" gets it wrong. Nobody has a right to pollute and tip our Mother Earth off balance. So the discourse needs a turn. We need to look at zero fossil emissions as the standard. They were actually the standard just a few generations ago and will become so again within our generation. Whoever deviates from that standard, creates the problem and needs to change. So if you look at the per capita figures, you can see that some countries still have a long long way to go, to get down to the climate-friendly zero carbon standard. 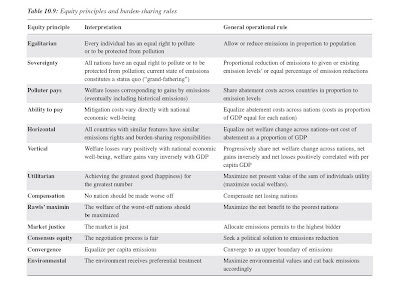 Another helpful thing to look at are equity principles. The Cancun text insists that mitigation efforts must be shared "on the basis of equity". 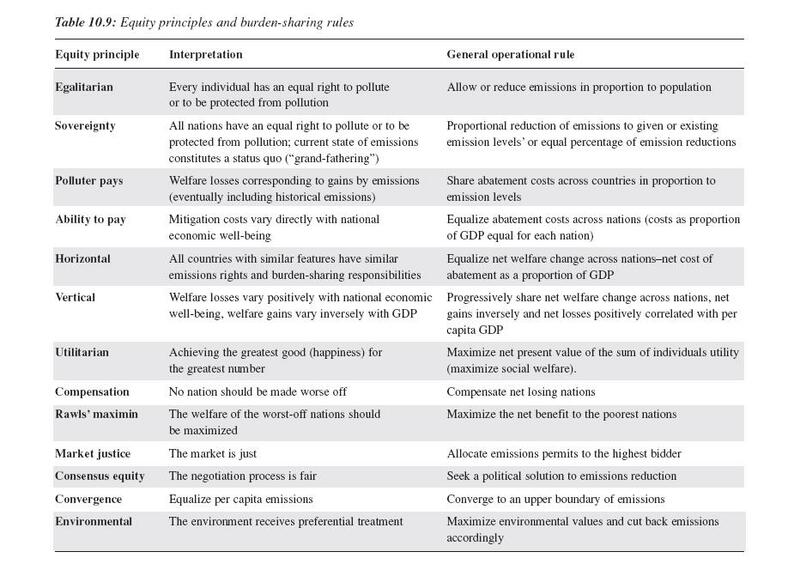 The IPCC has already (in its Third Assessment Report) compiled a list of equity principles (thanks to Jonathan Pershing for pointing this out): Once it is clear that the global goal must be zero emissions, and we need to get there as soon as possible, we can talk about how to shape this great transformation in an equitable way. The above principles will certainly help to come up with useful proposals.